...in the former position the plates may be freely inserted into and withdrawn from a keyhole; but if, when the plates are passed through the keyhole the rod be turned so as to bring the button at right angles to the plane of the plates, the said plates can no longer be withdrawn from the keyhole. The button is adjusted on the rod on which it slides to such a distance, that when the plates are put .. through the keyhole, the button passes through to the other side of the door [of course he is talking about the old Victorian doors with large keyholes! ], and when turned prevents the withdrawal of the plates. 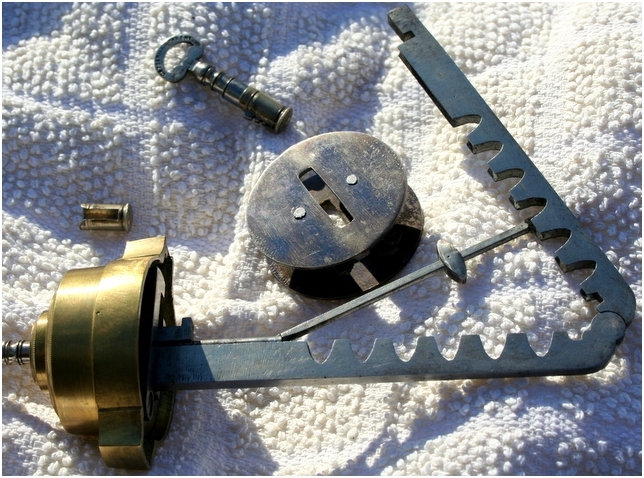 A small lock is situated on the unjointed end of the plates and is connected with the rod, so that on turning the key of the lock the said rod is turned, and places the button at right angles to the plates. In using the instrument, the button is first adjusted on the rod to the thickness of the door, the instrument inserted into the keyhole, and the key of the small lock turned. The instrument is thus fixed in the keyhole of the door lock, and can only be removed by the unlocking of the small lock [shown here, numbered with the letter 'L' as are the two keys, which might date the lock to 1868 if Cotterill's consecutive lettering from the patent date is followed]". The first two photos above show a round blued steel and centrally sprung distance piece. This has to be removed prior to inserting the plates through the door, and when replacing on the inside, the button's placement in the appropriate plate notches, will require to allow space for this. This picture below shows the rear of the small lock. The button is level with the plates, and in this open position the plates are separated. When closing the lock, the lower plate is moved inwards so that its cut enters the housing. When that is done the top hinged lever will move down to enclose and hold the botttom plate fast. 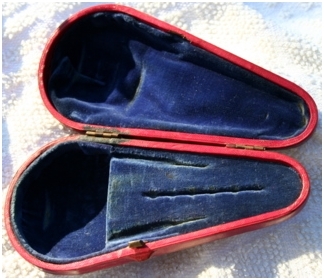 This type of lock-out instrument continued to be used long after Cotterill, and of course they had to be made much smaller. 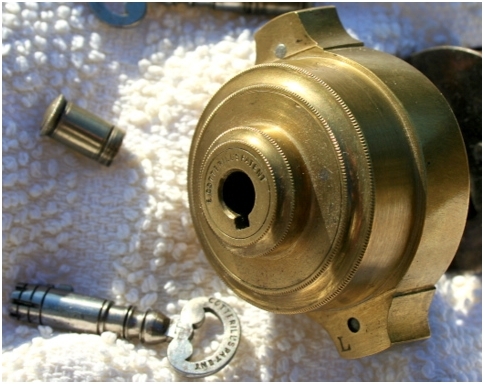 In USA, Shepardson patented this type (see below), and as will be seen it was manufactured by ILCO. The shaft end would have the projecting stub of metal turned inward by hand, the lock-out could then be pushed into the door keyhole. When the lock-out key is then turned, the stub would turn with it to hold the lock-out fast, and the key can be removed. A similar type of lock-out was made a few decades earlier than Cotterill, with S. Mordan of London in c.1830 inventing his Lock Protector (see below). This too has a small Bramah type lock operating on the outside, with a short, narrow pipe behind. 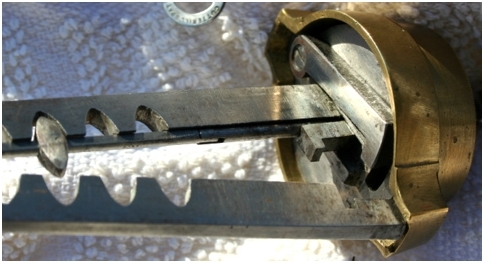 After the door is locked, the pipe is thrust into the keyhole and when the lock-out key is turned "two lancet-shaped pieces fly out laterally and bury themselves in the wood; thus preventing the removal of the protector unless its own key is applied".